In 1999, Centre County 911 Emergency Communications implemented a county-wide addressing project so we could provide residents and businesses with Enhanced 911 (E911). This project assigned street names and numbers to every residence and business in Centre County (that previously did not have a valid address) while eliminating all RD, RR and HCR Route and Box numbers. Some existing addresses were changed or corrected in order to follow the ranges for the road. The county-wide addressing project also collected telephone data that was integrated into the 911 database. Information collected and used in Centre County 911 is CONFIDENTIAL and by law is only used by 911 -- in and for emergencies! Municipalities, of course! They are responsible for addressing under the Pennsylvania Municipal Codes. The Townships are granted legal authority to name streets and address buildings via the Second Class Township Code and the same with Boroughs through the Borough Code. Municipalities can formally delegate responsibility to Centre County 911 in writing. CAN I PICK MY OWN ADDRESS? Unfortunately no, you cannot. Addressing is based on criteria. Centre County utilizes the Frontage Interval Addressing System which is based on measurement of intervals between the beginning of a road - and the structures along the road. It is also based on structure location and the direction in which the house or building faces the road. Visibility plays a factor as well. If the building is not visible from the road, the assignment is then based on where the driveway connects to the road. One thing for sure…addresses are not assigned where the mailbox is placed! WHAT IS REQUIRED? HOW DO I GET AN ADDRESS? You must own the property to get an address. Addresses will not be provided to potential owners. Obtain your building permit from the township. When you are ready to build, that is when you should get your building permit. Permits expire after 1 or 2 years -- depending on what borough or township you live in. If you don't build within that time frame, your address, along with your building permit, will be voided out and removed from the 911 system. To move forward, you will have to obtain another building permit or extension -- an additional expense. Because each municipality is different, we ask you to verify with your township or borough how long your permit is good for. If you meet the first two requirements, the next step is to contact our office with by email, fax or phone. Contact info is on our 911 home screen / website. Sketch plans are required. Your sketch plan should include the property lines (indicating where your property meets your neighbors), your driveway (include where it meets the road), and the location of where your home is to be situated. Your full contact information should be written on the sketch plan. If the sketch plan is not satisfactory or if we are unable to read the plan, we will request a second submission. For a basic map to create sketch plans, you can use Centre County GIS Map. **PLEASE NOTE: We will not assign an address to an empty lot. When 911 Addressing receives copies of your building permit, the data is then entered into our Address Database. The paperwork is then put into routing for our Field Tech. The Field Tech performs routine checks for new construction, demolitions, additions…anything that will require 911 assistance! Once construction starts on your new building, the Field Tech will digitize the building & driveway with a GPS Unit (Global Positioning Unit). This is then downloaded into our 911 mapping program. The Field Tech performs routine inspections throughout the county and he does so by Region (Penns Valley Region, Nittany Valley Region, Mountain Top, Moshannon Valley, Centre Region and Bellefonte). He’ll keep an eye on slow moving projects too! Centre County 911 Addressing maintains a database of existing and proposed street names within the county. We do this to prevent duplication that could potentially cause mayhem in emergency response. As mentioned earlier, all municipalities have the official or final approval for all road names; this includes any subdivision or land development plan as well. All streets will be named by the municipality. A road requires naming where two or more structures that are not clearly seen from the roadway. Private roads with two or more structures sharing the road requires naming. The road will be named by the property owners by selecting a majority favored name with the final approval by the municipality. Proposed road names should be submitted to us in writing for preliminary approval. The list should contain three to five (3-5) names ranked by preference. 911 Addressing will review the names with the existing county street list. A street name should be easy to read, easy to spell and easy to pronounce & understand so that children can use the name in emergency situations. We press for street names to add to the community by promoting local heritage, history and traditions, as well as, reflect local geography and character. Historically used road names should be retained where possible. No names which may be offensive or contain double meanings. Duplicate names or sound alike names cause confusion and location issues for emergency services. No duplicate names currently used in surrounding municipalities, within the same zip code or emergency service zone are permitted nor will be approved. No similar names or similar sound or pronunciation, within a municipality, zip code or emergency service zone are permitted nor will be approved. Examples: Smith, Smyth, Smythe, Allen or Alan. Use of frivolous or complicated words with unconventional spellings will be denied. Avoid the use of standard suffixes, prefixes or directional suffixes in the road name. Such as North Blvd, Avenue of the Pines, West St.
Avoid using family names or names of individuals of any living persons or politicians. Historical and pioneering names may be approved if they meet the recommendations. 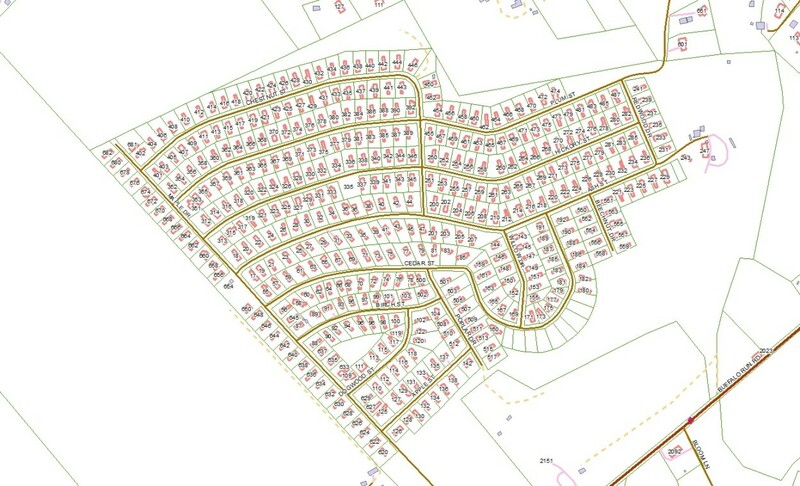 If you are submitting a subdivision or land development plan with new streets—a paper copy or digital image of the plan (PDF, JPEG) is required and should be attached to your road name request list. It is recommended when naming a subdivision, names with the same theme be placed throughout the entire subdivision as a means of general identification: Example: birds, flowers, states, trees. If you wish to preview your road name before submitting to 911 for review, use the link above. Street Signs: We encourage the use of public street signs to identify all named roads. Public street signs are the responsibility of the municipality. It is a good idea to check with your township or borough about their sign policy. Signs in PennDOT right-or-ways must meet the PennDOT standards, including the street name in reflective white letters on contrast background. (white on green) (white on blue) (white on black). Private Road Signs – residents are required to purchase and install signs on their private roads where the municipality does not. Private road names must be approved by the municipality. Vanity Signs are signs a resident will purchase and install to recognize their name, hobby or something of personal interest. Samples include Harley Davidson Alley, Buffalo Bills Blvd, Whitetail Lane, Nascar Raceway, Steeler Blvd. We strongly discourage these signs. They present very dangerous situations, often adding confusion and delays to emergency response. How do they do that? Because these are not municipal approved road names or signs, and they are not on our 911 maps! As a result, unapproved or invalid road names necessitate additional time response time. We want residents to understand the dangers of vanity signs. Remember, if we can’t find you, we can’t help you! House numbers are assigned by a standardized address interval system of 20.8 or 52.8 feet depending on the existing addressing in each municipality. The interval distance is measured from the starting point of each roadway. An address would be assigned approximately every 20.8 and 52.8 feet to allow room for growth and future addressing. Each block contains 50 odd numbers and 50 even numbers. Any resident who rents an apartment or a business office space, should have a secondary location indicator (apartment or suite number) assigned to their address. This is very important. If a resident has no apartment or suite number, you must contact your landlord immediately to get a secondary number assigned. The secondary number will help Emergency Services locate the apartment or suite within the building. The house number shall be made up of numbers and/or letters which are contrasting in color with the background they are affixed to. Numbers should be placed as near to the front entrance or above the garage door as possible, legible -- day or night -- from the road, the opposite side of the street, and the sidewalk (if any. Examples are listed below. Please check with your municipality for their specific requirements. Residences, Townhouse and "In-Town" Businesses: Numbers shall be at least four (4) inches in height and well lit. Apartment Building and High-Rises: Numbers shall be at least six (6) inches in height. Apartment numbers for individual units within the complex shall be displayed on or above or to the side of the doorway to each unit. Industrial and Commercial Structures: Numbers shall be at least ten (10) inches in height and well lit. Private Lanes and Long Driveways: A resident whose house number is not clearly visible from the street should install a post or sign near the end of the driveway with reflective, easy-to-read numbers at least four (4) inches in height, and at least forty-eight (48) inches above the ground. It is strongly recommended residents contact their post office with their new address six to eight (6-8) weeks PRIOR to moving into your new home. Residents should notify proper businesses and agencies as well. Some examples are utility companies such as telephone, electric, cable; financial institutions; credit cards; insurance companies; relatives; PennDOT; and any other necessary organizations you are in regular contact with. Work with your post office for the placement of your mailbox and mail delivery. Which post office should I use? The post office is a United States (Federal) Government entity. They determine their delivery boundaries. 911 is a county/local department and is concerned with emergency services. 911 does not have authority over the United States Post Office to determine delivery jurisdiction. NOTE: not all addresses will be on this website. This website represents homes or businesses that have mail delivered. If you live in a Post Office Box Community -- where there is no mail delivery to your home -- your address will not show up on the United States Post Office website.